Seven Sisters is a party featuring only female DJs, celebrating our heritage from the Pleiades star system. DJs are Miss Tick, Spacekicca, PoyEsta and Back To Mars playing varied styles, so you can expect world beats, techno, minimal, progressive and psychedelic trance. Aes Sedai will create sacred space and perform mystical dance and Dogarian will decorate the location, Paviljoen Aquarius. Aquarius is a charming beach style venue right in front of the Nieuwe Meer lake in Amsterdam, situated at the opposite side of the Amsterdamse Bos forest. The venue have a terrace downstairs and beautiful dance floor on the second level with a balcony and a breathtaking view of the lake and surrounding forest. TRAM 2 - direction Nieuw Sloten, stop at Kasterleepark, then 15min walk to the location. BUS - 195, 197, 245, N97 stop Oude Haagseweg. 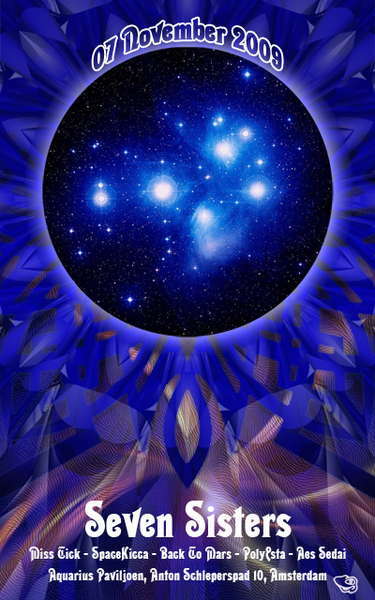 The Pleiades also known as the Seven Sisters, is the name of an open cluster dominated by hot blue stars. The nine brightest stars of the Pleiades are named from the Seven Sisters of Greek mythology: Maia, Taygete, Merope, Alcyone, Electra, Asterope and Celaeno, along with their parents Atlas and Pleione. The Pleiades' high visibility in the night sky has guaranteed it a special place in many cultures, both ancient and modern. It is among the nearest to the Earth of all open clusters, probably the best known and certainly the most striking to the naked eye. Ancient civilizations looked to the heavens as guides for their daily lives. They created mythological tales about those who came from the different star systems. They believed that the gods lived in the heavens and sometimes flew down to the planet bringing messages and teachings. These people communicated with their gods through meditation and dreamtime. As we gather on the 7th of November for the dance of the Seven Sisters, we will honor our Ancestors and visualize the most wise and beautiful probability that we can experience here on Earth, as a species living in our full potential and united once again with All that Is. With our Heart beat we will follow our feet on a dancing path to freedom. Looking forward in sharing the enchanted ways with you. The Seven sisters and Prog as a Frog crew.